We offer an extensive range of drinkers suitable for internal and external use. The plastic used in our drinkers has high freeze/thaw cracking resistance, a particularly important feature in freezing conditions. Each drinker is designed with rounded edges for ultimate animal safety. Strategically positioned mounting holes or brackets are provided for secure fitting and ease of installation, where applicable. 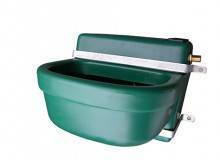 Large reservoir capacity bowl fitted with a float valve to maintain water at a constant level. Built in drain off and 2 stainless steel mounting brackets provided for secure fixing. 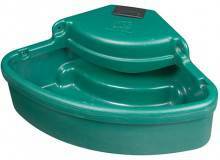 Large reservoir 16L capacity bowl fitted with a fast fill float valve. Built in drain off and 2 stainless steel mounting brackets provided for secure fixing. This long, narrow drinker can be placed between 2 zoned areas giving several animals simultaneous access to water. Fitted with a 1/2" brass valve and drain-off plug (25mm). 2 stainless steel mounting brackets provided for secure fixing. 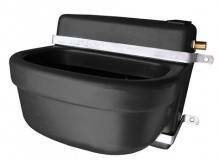 A large reservoir capacity bowl the water is covered by a swinging lid to prevent contamination from dirt. Fitted with a 1/2" brass float valve and drain-off plug (25mm). 2 stainless steel wall brackets supplied for secure fixing. 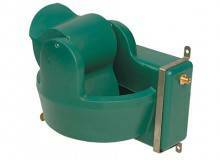 Large reservoir capacity bowl fitted with a 1/2" valve and drain-off plug (25mm). Valve protected within plastic housing. 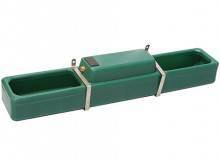 4 mounting points for secure fitting to a shed or stable corner.